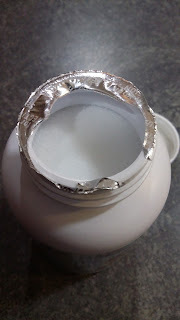 Heartfelt Balance Handmade Life: Take that Stink out of your Washer with Smelly Washer Cleaner! Take that Stink out of your Washer with Smelly Washer Cleaner! Peeeeeuuuuu! That's what I think every time I'm near my front-loader washer. Unfortunately, I didn't realize that there was so much mold growing inside. That's just gross and icky, right? Blech. The machine that is supposed to be getting our clothes clean is not clean. How are the clothes supposed to come out clean? The same goes for my dishwasher. If the dishwasher is not clean, how can it get the dishes truly clean? I wanted a front-load washer so badly when our last washing machine was dying. I was all caught up in the high-efficiency, money-saving, water-saving hype of it all. And for the most part, I've liked having my washer. But, that smell! We leave the door open between washings so that it has a chance to air out, but it still gets moldy. Unfortunately, there is some mold on the rubber seal that I didn't even know was growing and now I can't even get it out with bleach. I let it go too long, because I just didn't know! I'm no Martha Stewart when it comes to cleaning and organizing schedules. Everything else in life seems to come before cleaning my clothes washer on a regular basis. I'm lucky to get the clothes washed IN the washer on a regular basis. I was recently given the opportunity to try out Smelly Washer cleaner. I received Smelly Washer cleaner for free and received a small compensation for my time in exchange for my honest review. As always, all opinions are my own. I'm not here to tell you that Smelly Washer cleaner is a super-powered substance that will get that mold stain on the rubber seal out. It didn't get that stain out. But it did freshen my washer and took care of 90% of the smells. I would call that successful. I was even able to mix the Smelly Washer cleaner in a bottle with hot water so that I could target the rubber seal better. I just sprayed the entire seal, making sure to fold the seal down where it has the little indent. When I used my Smelly Washer cleaner for the first time, I stuck my entire head inside the washer and gave it a big whiff. It definitely smelled better. Just to make sure, I stuck my head in several more times and sniffed around. Yep. Definitely better. I was a little confused about the directions because it said to put a capful into the washer and if you are familiar with front-loader washers, usually you put any kind of soap into the pullout dish (I know, technical!) somewhere around the top front of the washer. Another thing that confused me was that I thought my washer wouldn't even run a load without clothes in it since my washer weighs the clothes to see how much water it needs to use. Going to the actual Smelly Washer website helped clear some things up. Instead of running the washer empty when I used the Smelly Washer Cleaner, I used it with a load of towels. You are supposed to use the washer cleaner with hot water, so I figured towels would be a good choice. The directions say that you can use the cleaner with a load of whites, but I didn't have any issues with my towels. I think the main issue is that the cleaner might cause fading if the clothing or towels are newer. Quite frankly, it doesn't matter to me if my towels fade because we use them to dry ourselves. They aren't a "fashion" statement in our bathrooms. But, they didn't fade. Since my washer was a little on the bad side, I ran another load with the cleaner and paused the washer for a little over an hour to let it soak. The directions say for more extreme cases, pause to let it soak. You can even let it soak overnight. I also used it in my dishwasher. My dishwasher was so shiny once it was done. The directions for the dishwasher are to put half a cap in the dishwasher detergent dispenser and half a cap in the bottom of the dishwasher. Since I just can't find it in myself to run a dishwasher empty, I also put my sink drainers and my dish drying rack in the dishwasher while I cleaned it. Smelly washer cleaner claims to be natural, but you still need to keep it out of reach of pets and kids. It is small crystals that look like sugar, so really, really keep it away from kids. The warning label says "Do not eat. Do not mix with bleach or other chemicals. No eye contact. Flush eyes immediately with water for 10 minutes if there is contact. Fading may occur with new colored items." I can't seem to find any info about what it's made out of, only that it's natural. As I said, the washer cleaner looks like little crystals and it's totally fragrance free. It has no scent and is totally organic. Smelly Washer cleaner sells for $14.99 per bottle and each bottle has 24 treatments. If you wash your washer and dishwasher once a month, the bottle should last an entire year. You can find more information at Smellywasher.com where you can also purchase Smelly Washer Cleaner. Smelly Washer cleaner is also available at Amazon, Ace Hardware Stores, Sears, Do it Best stores, Hyvee and others. It's also available in Canada at Mr. Appliance. Have you ever tried Smelly Washer cleaner? I've never heard of it, but I really need it. I absolutely HATE my front-load washer. It smells, it's super loud, it's obnoxious. I would advise anyone to run in the opposite direction from these. Stick with what the top-load. I think they have newer more efficient top-loaders now, don't they? I like my front loader except for that seal and the fact that I can't wash pillows in it!